Won by the superiority of the Longbow, the Battle of Homildon Hill (1402) saw a Scottish raiding force routed. The victory further enhanced the reputation of Sir Henry 'Hotspur' Percy but the subsequent dispute over prisoners and the King's failure to reimburse the family for the vast expense, ultimately pushed them into rebellion. In 1399 Henry Bolingbroke, aided by a significant proportion of the country's leading magnates, overthrew Richard II whose reign had increasingly become seen as tyrannical. Bolingbroke succeeded to the throne as Henry IV but, as so often with regime change, his opponents sought to capitalise on the resultant instability. In Spring 1402 this manifested itself as a major and sustained rebellion in Wales under the leadership of Owain Glyndŵr which drew the King's attention, and more importantly his feudal host, away from the English-Scottish border. Regardless of the political situation in England, relations between the two countries at this time were strained. Border warfare had continued intermittently ever since the Wars of Scottish Independence started in 1296. Fortunes ebbed and flowed between the two sides but the political strife in England and Wales caused by the change in regime was too good an opportunity to be ignored. The Scottish King Robert III had refused to accept Henry IV as King - he referred to him as the 'Duke of Lancaster' - and it was with Royal approval that a Scottish force attacked England in June 1402. Mention must also be made of George Dunbar, Earl of March. This Scottish magnate had fought against the English at the Battle of Otterburn (1388) and had been a leading figure at court. His daughter, Elizabeth, was betrothed to Robert III's son - David Stewart, Duke of Rothesay - but through the political machinations of Archibald 'The Grim' Douglas, Earl of Douglas this match was frustrated. George renounced his allegiance to Robert III and fled south seeking protection from Henry IV who was happy to oblige and granted the exiled magnate Somerton Castle in Lincolnshire. A bitter rivalry now existed between the Douglas and Dunbar clans. The Scots invaded England in June 1402. An initial encounter at the Battle of Nesbit Moor saw a small English force under the exiled George Dunbar, Earl of March defeat a Scottish force twice their size. Undeterred, a much larger military force invaded in August 1402. A force of around 10,000 men raided North-East England and advanced as far south as Newcastle-upon-Tyne. Laden with plunder, which slowed their progress, the Scots commenced a withdrawal towards Coldstream. Despite the ongoing troubles in Wales, the Percy family mustered a significant force including a large contingent of Longbowmen drawn from Wales and Cheshire. The new army was headed by Northumberland's son - Sir Henry 'Hotspur' Percy - and George Dunbar, Earl of March. They managed to manoeuvre ahead of the Scottish force and occupied the road near Milfield barring the Scottish route back to Coldstream. Most of the sources for the battle place Scottish numbers around 10,000 and this included a significant number of magnates including the Earls of Angus, Douglas, Moray and Orkney. Their force consisted of spearmen and some archers - the latter armed with the traditional Scottish bow that was smaller than that used by the English. Numbers for the English are disputed with one source claiming 12,000 spearmen and 7,000 archers. However, it is likely these figures are significantly over-inflated and numbers closer to 8,000 infantry and 4,000 archers are more plausible. The latter were equipped with the formidable longbow which had already been proven to tremendous effect at such battles as Halidon Hill (1333) and Crecy (1346). The battle was fought on the 14 September 1402. The Scottish forces seem to have suffered from poor intelligence for it was only as they marched out of Wooler that it became apparent to them that an English force was blocking their path. 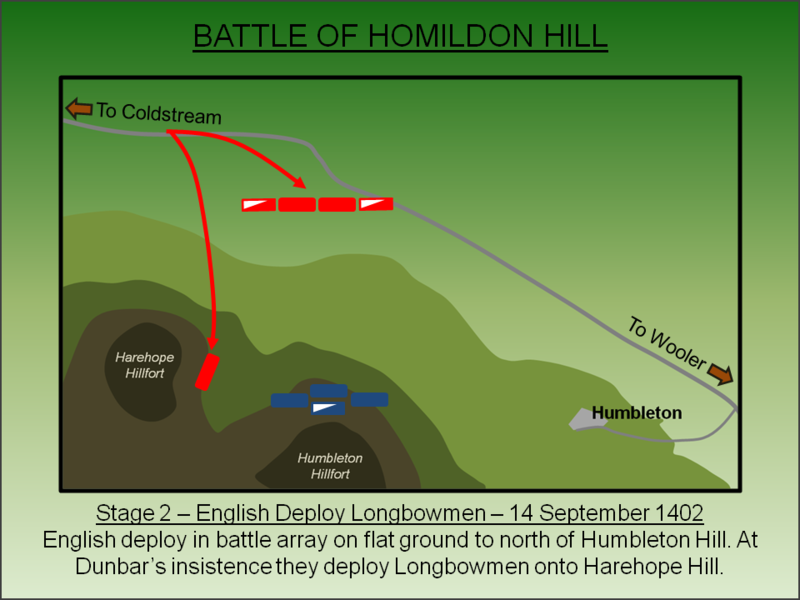 The Scots wheeled left off the main road, passing the tiny hamlet of Humbleton and took up positions on the north facing slope of Homildon Hill (known now as Humbleton Hill). Accordingly to contemporary sources, Percy was keen to launch a frontal attack against the Scots but was persuaded otherwise by George Dunbar. 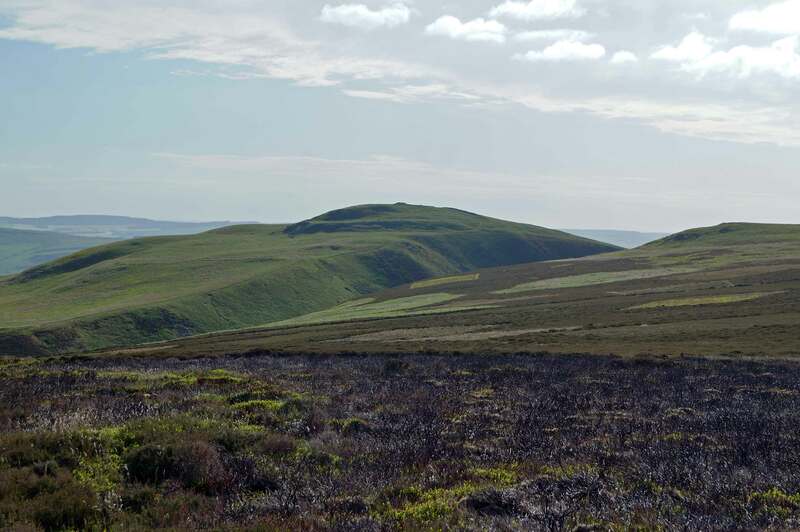 Instead the English deployed their Longbowmen onto Harehope Hill, which was separated from the Scottish position by a steep sided ravine, whilst his main force waited in battle array on the flat ground below. The Scots drew up in their traditional schiltrons - a tightly packed mass of spears that was extremely effectively against enemy infantry formations but very vulnerable to ranged attack due to the large target it presented. The battle commenced with a sustained assault by Percy's archers against the largely unarmoured Scottish infantry. The Scottish suffered heavy casualties. The Scots moved their own archers into position to counter-attack but their shorter bows placed them at a severe disadvantage. The Longbowmen - many drawn from Wales and Cheshire which, by this time, had a long tradition in archery - were able to maintain accurate, high intensity attacks against the Scots whose own arrows fell short. The Scottish archers fled and attacks resumed on the main force. 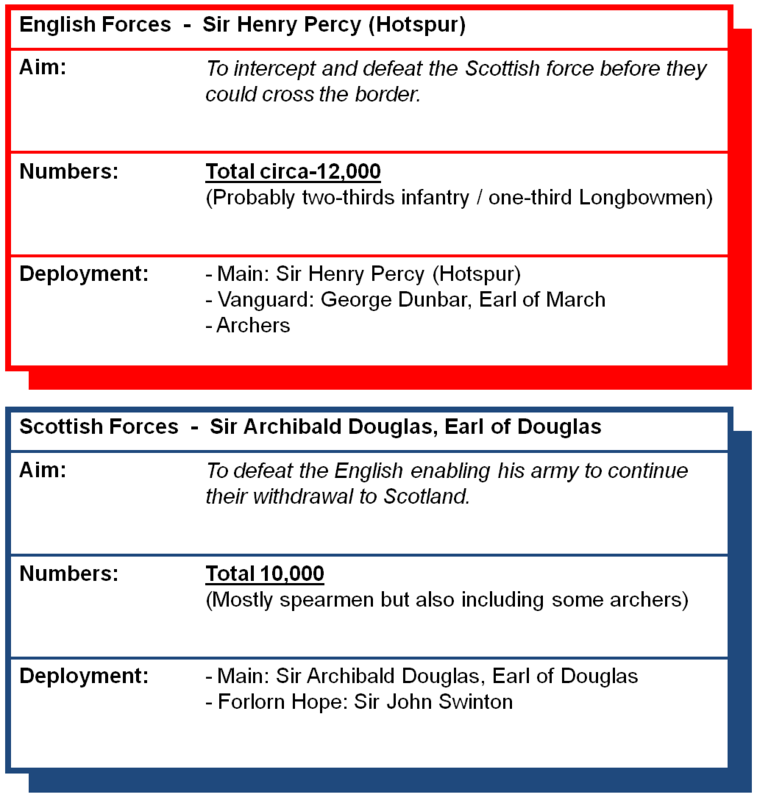 Douglas, frustrated with seeing his army destroyed without even coming into direct contact with the enemy, now led a large detachment of Scots against the troublesome archers. However, their progress was slowed by the terrain and the Longbowmen were able to mount a staged withdrawal whilst sustaining their attack. The effectiveness of the English arrows defused and then defeated the Scottish assault. Douglas himself was captured as were many who chose surrender rather than suffer further attacks from the archers who simply reclaimed their original ground and resumed their attack on the main body of the Scots. With Scottish casualties now critical and no sign the English were going to run out of ammunition, Sir John Swinton charged against the main body of English on the flat ground below the hill. They were swiftly defeated and the entire Scottish force broke into rout. Many fled and were pursued to the border with contemporary records suggesting up to 500 men drowning as they fled across a river. The battle was an overwhelming English victory but, with regard to relations between the two nations, it achieved little. Henry IV remained distracted by internal problems and was unable to take advantage of the weakened Scottish position. Instead the significance of Homildon Hill comes from its impact in England. A large number of high-status prisoners were captured following the Scottish defeat including Archibald Douglas himself, George Douglas (Earl of Moray), Henry Sinclair (Earl of Orkney) and Murdoch Stewart (son of the Duke of Albany) plus 80 Knights. The value of these individuals, the vast majority of whom the Percy family would have expected to ransom, was significant but Henry IV had other ideas. Fearful of so many Scottish nobles being returned to their home country, Percy was instructed to transfer all prisoners to the King's control. Coupled with the lack of any significant reimbursement for the costs of the war, the net effect of the Battle of Homilton was the Percy disenchantment with the Lancastrian regime. They rebelled the following year, working in conjunction with Douglas and Owain Glyndŵr in Wales, but were defeated at the Battle of Shrewsbury (1403). English Heritage (1995). Battlefield Report: Homildon Hill (1402). Lancaster, J.H.D (2015). 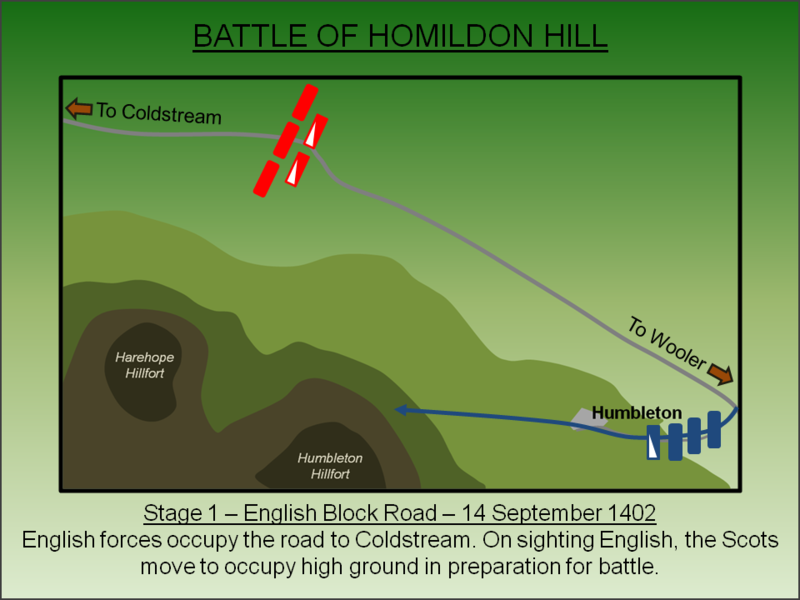 Homildon Hill: Battlefield visit notes and observations. CastlesFortsBattles.co.uk. The battlefield remains largely undeveloped. The standing stone, once thought to be a monument to the battle, can be seen near the main road. The remains of Humbleton Hillfort are quite impressive and the walk to/from that site offers a superb stroll across the battlefield. Battle Stone. This standing stone, which is found near the position of the centre of the main English force, was thought to have been placed as a memorial to the battle. In actual fact it is much older. Slopes of Homildon Hill. As the Scots approach and saw the English force blocking their route, they ascended the slopes of Homildon Hill (now called Humbleton Hill). English Position. The English mustered on the flat plain below the hill controlling the road. Scottish Position. This picture is from just behind the Scottish position (they were on the downward of the hill). Harehope Hill, where the English archers mustered, can be seen to the left. Harehope Hill. The English archers deployed here to deliver their devastating bombardment against the Scottish forces. Scottish Deployment. Homildon Hill commands the surrounding area. Humbleton Hillfort. 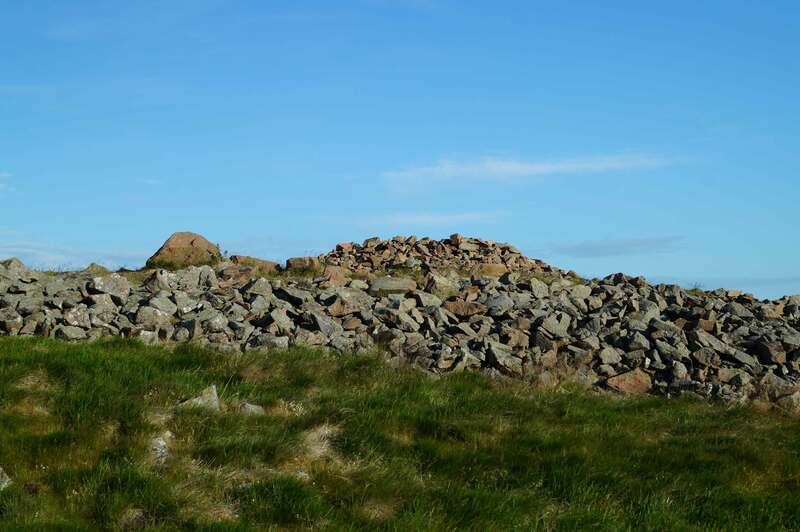 The hillfort consists of two stone built ramparts with adjoining enclosures. It is uncertain when the initial fortification was constructed - it is mooted to have been either Bronze Age or Neolithic - but the univalate defences date from the Iron Age and its final configuration suggests possible post-Roman occupation. 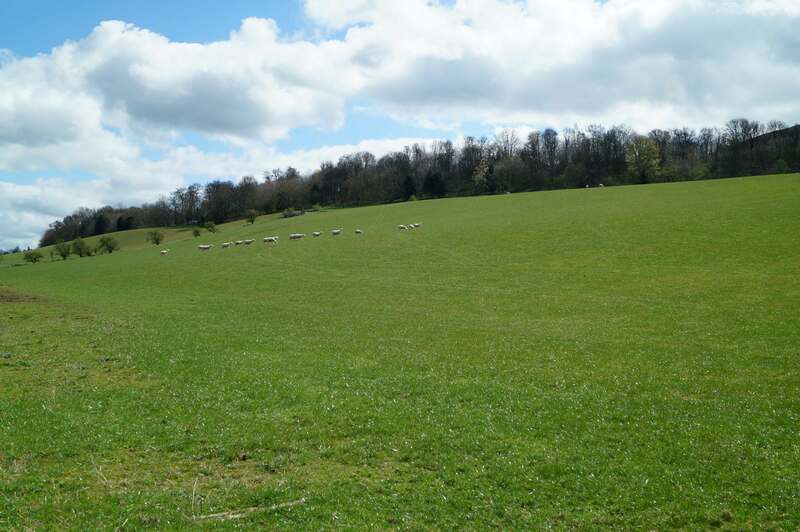 Further modifications were made during the medieval period when the site was used as a shelter for shepherds. 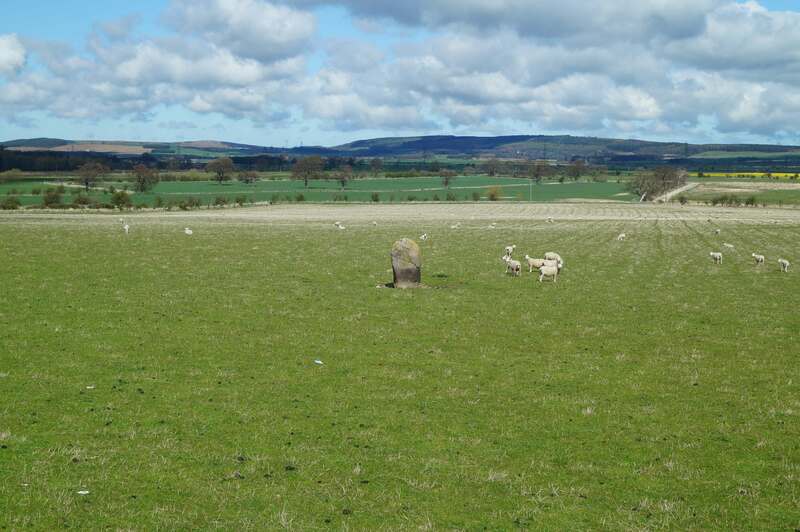 The standing stone can be found just off the A697 with a parking area just a few hundred yards away - nevertheless take extreme car crossing the busy (national speed limit) road. The hillfort, which offers superb views of the area, can be accessed via a network of footpaths some of which cross the battlefield.